An Online Tutor job description may vary greatly based on the level, college and position structure. The main task, however, is to guide, teach and instruct students on a particular course or courses just like a normal tutor, but they have to do so by using the influence of the Internet. 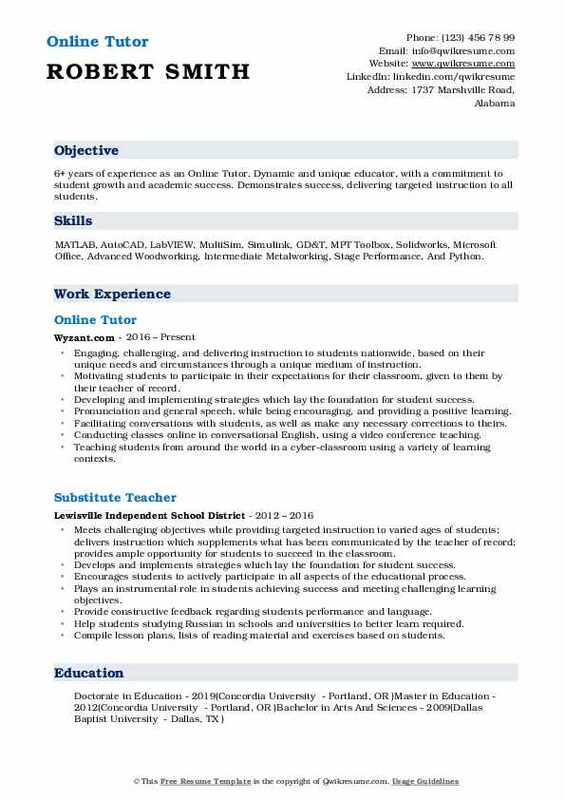 Online Tutor Resume mentions duties similar to the following – answering to the questions raised by students online; resolving technical and connectivity issues, responding to messages from school administrators and peers; assessing student progress, suggesting programs or curriculum improvements, and at times setting a virtual classroom atmosphere for the students. The minimum education level includes a Bachelor’s degree or Master’s in relevant subjects; beyond the education requirement employers look out for these skills and abilities – a strong grasp over online teaching tools, a strong internet-connected computer system with a webcam, experience,and knowledge of the specific subject that is being tutored and familiarity with Skype tutoring. 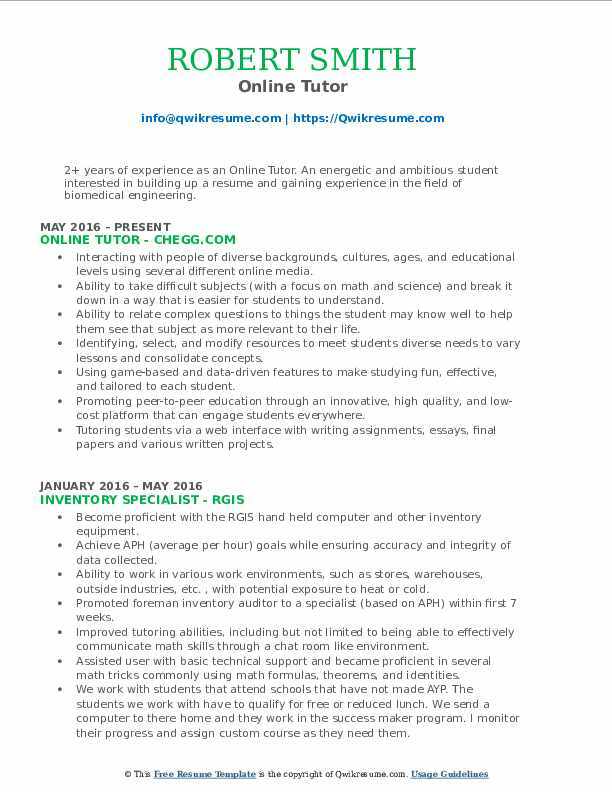 Objective : One year of experience as an Online Tutor is now looking to gain professional experience in programming and software development. A desire to improve my current knowledge while learning new things. Skills : Android, C+, Java, Python, SQL, Microsoft Office, Advanced Woodworking, Intermediate Metalworking, And Stage Performance. Providing students with an understanding of how to solve problems by working through them step by step. Creating a maze game, with a team, where the goal is to navigate from the top floor to the bottom. Creating a system that only shows path within the possible line of sight. Creating various data structures such as linked lists, hash tables, and queues to understand the concepts of data storage. Exploring the time complexity of data structure navigation, and other operations. Building object-oriented programming fundamentals to implement navigational algorithms in graphs. Learning how to work with the android studio development kit, learning XML and Java in the process. Learning how to create apps for different sized devices by understanding how the scenes are. Creating an Othello type game that works with one and two players, and shows all possible moves for a players turn. 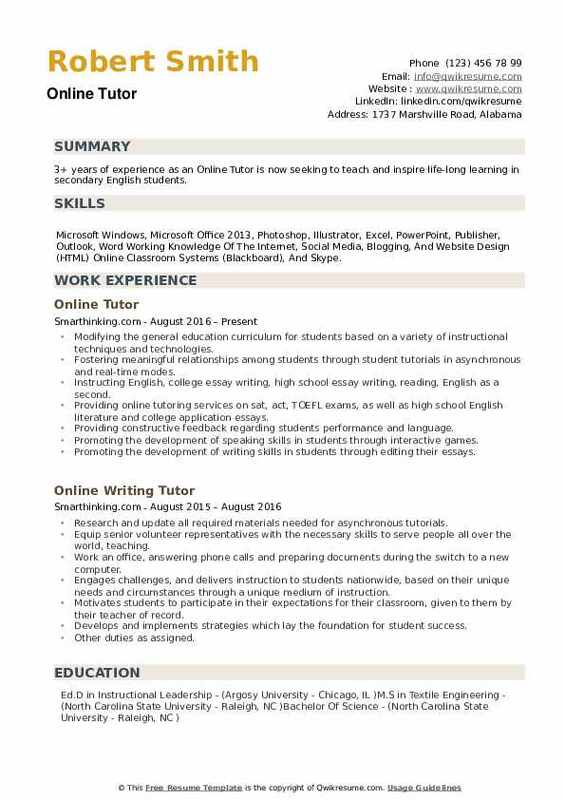 Objective : One year of experience as an Online Tutor. A Dedicated and passionate psychology graduate seeking a company that will allow him to actively apply his skills. Skills : Coachable, Detail Oriented, Patient, Fast Learner, Responsible, Bilingual, Interpersonal, And Organizational. Applying psychological teaching skills to maximize mastery of students with poor grades. Tutoring in Psychology, Sociology, Biology, Religion, Geology, English, Literature, Medical Terminology, Test Prep, Anatomy, and Latin. Learning how to break down complex concepts into smaller, workable components. Learning how to work with students from a variety of different time zones. Working with a variety of age ranges, from junior high to senior citizens. Developing and honing learning/teaching practical tools with a psychological basis to maximize memorization and learning. Providing structure, editing, and general writing advice in a live, online setting. Summary : 8+ years of experience as an Online Tutor is now looking for a part-time job or full-time job as an electronic base assembly assistant with a great company. 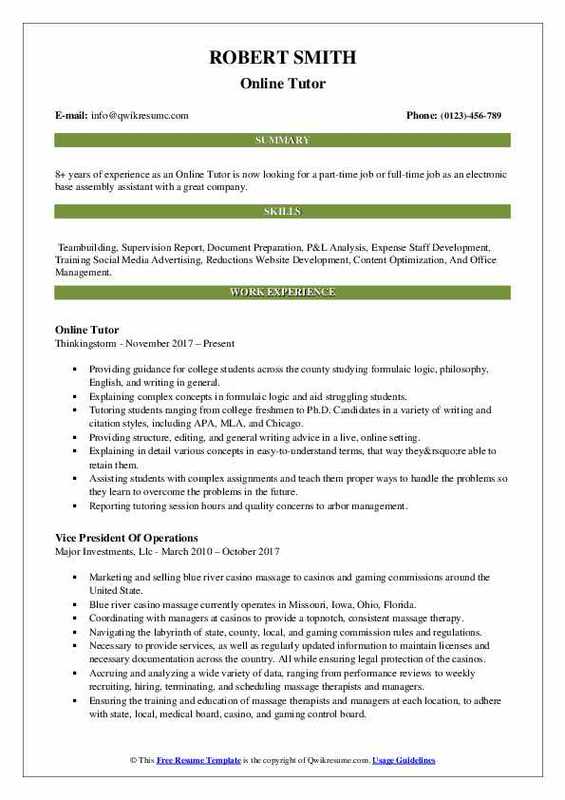 Skills : Teambuilding, Supervision Report, Document Preparation, P&L Analysis, Expense Staff Development, Training Social Media Advertising, Reductions Website Development, Content Optimization, And Office Management. Providing guidance for college students across the county studying formulaic logic, philosophy, English, and writing in general. Explaining complex concepts in formulaic logic and aid struggling students. Tutoring students ranging from college freshmen to Ph.D. Candidates in a variety of writing and citation styles, including APA, MLA, and Chicago. Explaining in detail various concepts in easy-to-understand terms, that way they’re able to retain them. Assisting students with complex assignments and teach them proper ways to handle the problems so they learn to overcome the problems in the future. Reporting tutoring session hours and quality concerns to arbor management. Headline : 6+ years of experience as an Online Tutor. I want to use my effective, positive, and flexible teaching style paired with my willingness to work beyond the call of duty, to make learning accessible to all students. I have a wealth of experience in leadership roles to contribute to a staff. I have helped establish and then certify a school as a STEM school and can bring that passion and innovative thinking to future positions. Skills : MultiSim, Simulink, GD&T, MPT Toolbox, Solidworks, Microsoft Office, Advanced Woodworking, Intermediate Metalworking, Stage Performance, And Python. Working with students of all ages online, mainly from high school to college, with all levels of ability. I specialize in the departments of earth science, mathematics, and physics. Integration with known/unknown techniques of integration and boundaries derivatives. Sedimentation and stratigraphy physical and historical geology igneous and metamorphic. Use online educational platforms such as web and aboard to enhance distance learning. Handling online technical problems such as video issues or connectivity problems. Monitoring student progress and ensure that a periodic evaluation is conducted. Assisting students in developing their study skills in accordance to the needs of each subject. Summary : 10+ years of experience as an Online Tutor. 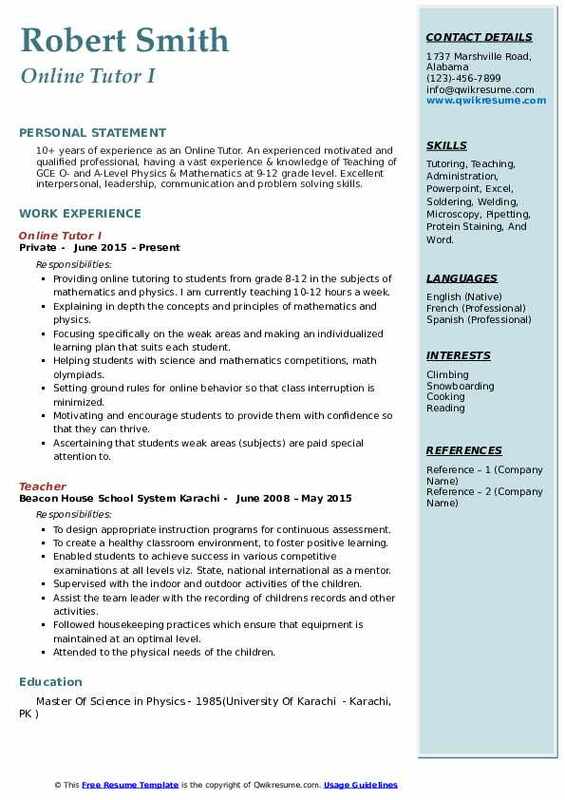 An experienced motivated and qualified professional, having a vast experience & knowledge of Teaching of GCE O- and A-Level Physics & Mathematics at 9-12 grade level. Excellent interpersonal, leadership, communication and problem solving skills. Skills : Tutoring, Teaching, Administration, Powerpoint, Excel, Soldering, Welding, Microscopy, Pipetting, Protein Staining, And Word. Providing online tutoring to students from grade 8-12 in the subjects of mathematics and physics. I am currently teaching 10-12 hours a week. Explaining in depth the concepts and principles of mathematics and physics. Focusing specifically on the weak areas and making an individualized learning plan that suits each student. Helping students with science and mathematics competitions, math olympiads. Setting ground rules for online behavior so that class interruption is minimized. Motivating and encourage students to provide them with confidence so that they can thrive. Ascertaining that students weak areas (subjects) are paid special attention to. Headline : 6+ years of experience as an Online Tutor. 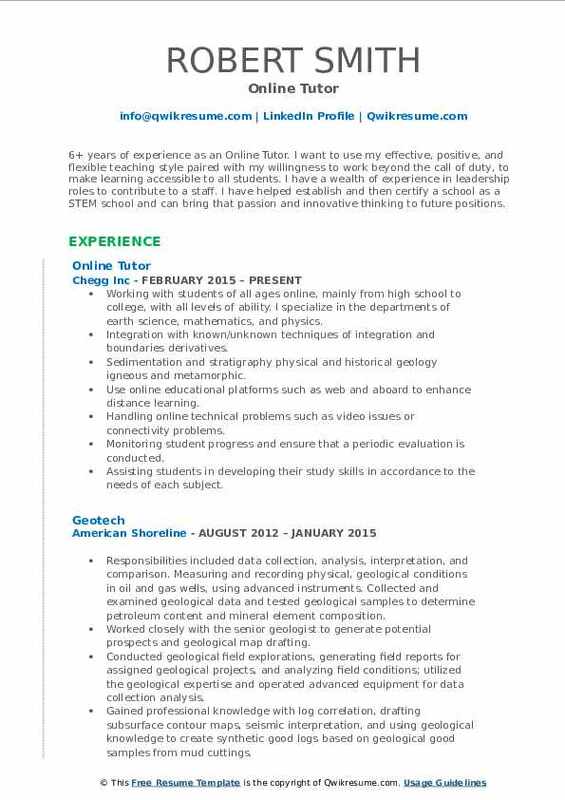 Dynamic and unique educator, with a commitment to student growth and academic success. Demonstrates success, delivering targeted instruction to all students. Skills : MATLAB, AutoCAD, LabVIEW, MultiSim, Simulink, GD&T, MPT Toolbox, Solidworks, Microsoft Office, Advanced Woodworking, Intermediate Metalworking, Stage Performance, And Python. Engaging, challenging, and delivering instruction to students nationwide, based on their unique needs and circumstances through a unique medium of instruction. Motivating students to participate in their expectations for their classroom, given to them by their teacher of record. Developing and implementing strategies which lay the foundation for student success. Pronunciation and general speech, while being encouraging, and providing a positive learning. Facilitating conversations with students, as well as make any necessary corrections to theirs. Conducting classes online in conversational English, using a video conference teaching. Teaching students from around the world in a cyber-classroom using a variety of learning contexts. 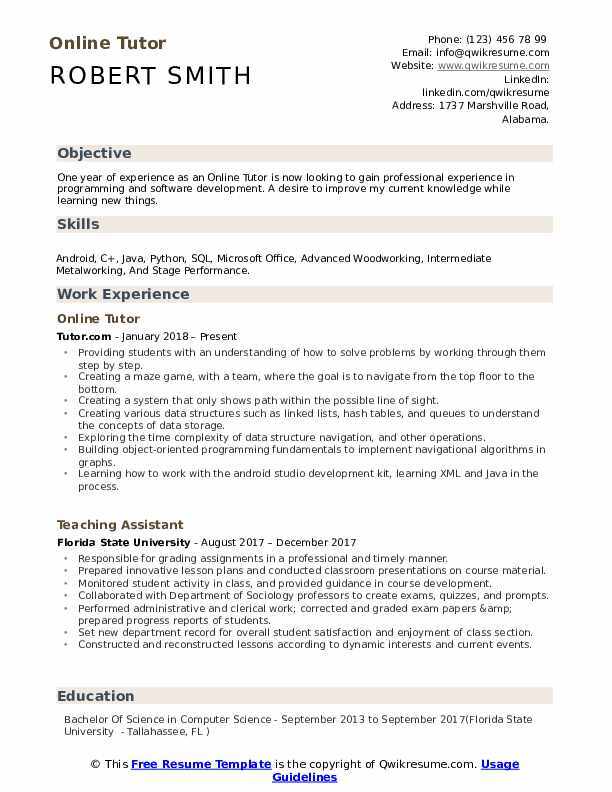 Objective : 2+ years of experience as an Online Tutor. An energetic and ambitious student interested in building up a resume and gaining experience in the field of biomedical engineering. Skills : Powerpoint, Excel, Soldering, Welding, Microscopy, Pipetting, Protein Staining, Word, Customer Service, Product Manager, And Tutoring. Interacting with people of diverse backgrounds, cultures, ages, and educational levels using several different online media. Ability to take difficult subjects (with a focus on math and science) and break it down in a way that is easier for students to understand. Ability to relate complex questions to things the student may know well to help them see that subject as more relevant to their life. Identifying, select, and modify resources to meet students diverse needs to vary lessons and consolidate concepts. Using game-based and data-driven features to make studying fun, effective, and tailored to each student. Promoting peer-to-peer education through an innovative, high quality, and low-cost platform that can engage students everywhere. Tutoring students via a web interface with writing assignments, essays, final papers and various written projects. 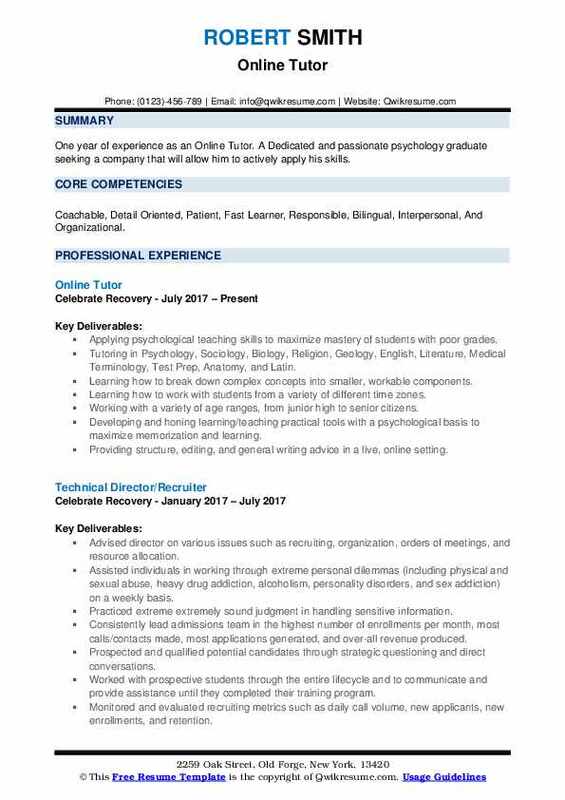 Objective : 3+ years of experience as an Online Tutor is seeking to obtain a job working in the Psychological field, specifically ABA where I can have an opportunity to advance in my career and be a positive impact to the community by helping individuals with problem behaviors that may be affecting their private and social lives. Work with k-12th-grade students who are struggling in different subjects. Teaching different concepts in an online virtual classroom using different methods and tools to absorb the information being presented. Preparing students for diverse types of assessments and sats to track their progress and focus in areas where they are still scoring low. Developing and implements strategies which lay the foundation for student success. Worked with students of different language backgrounds, cultures and skill levels. 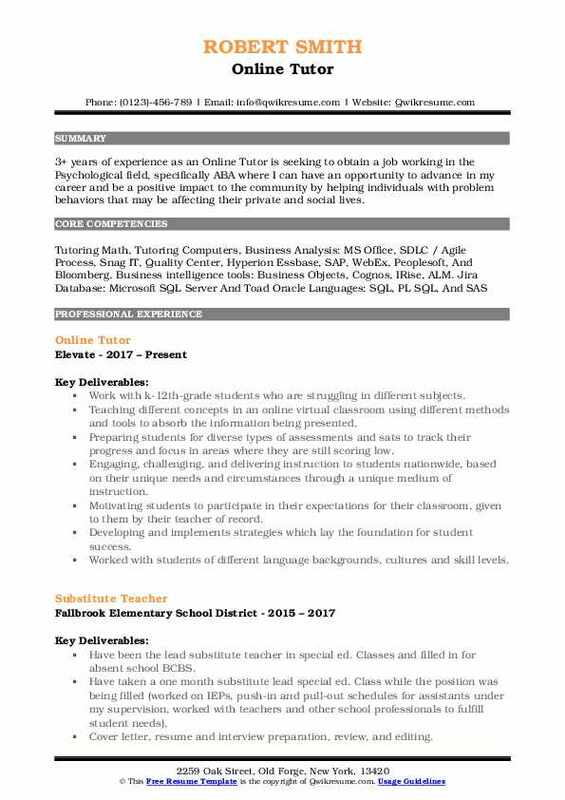 Summary : 7+ years of experience as an Online Tutor is looking to secure a position that will fully utilize my experience, education and interpersonal skills. 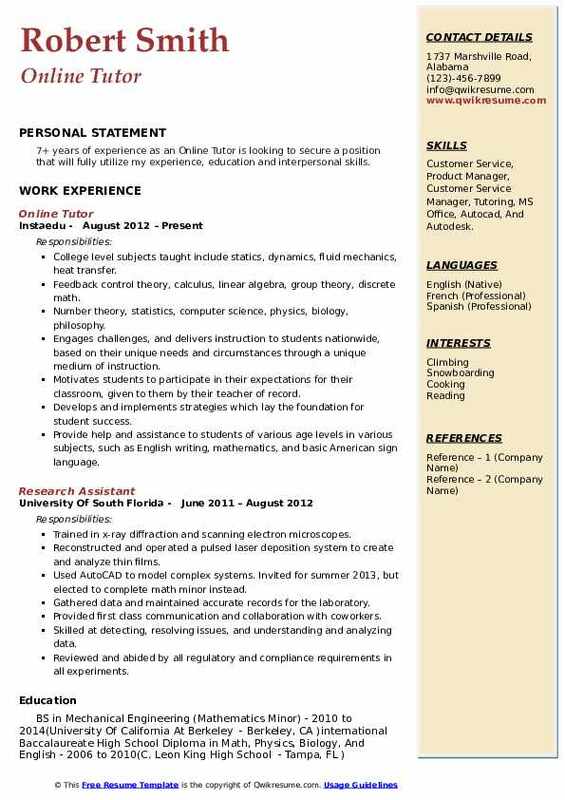 Skills : Customer Service, Product Manager, Customer Service Manager, Tutoring, MS Office, Autocad, And Autodesk. College level subjects taught include statics, dynamics, fluid mechanics, heat transfer. Feedback control theory, calculus, linear algebra, group theory, discrete math. Number theory, statistics, computer science, physics, biology, philosophy. Engages challenges, and delivers instruction to students nationwide, based on their unique needs and circumstances through a unique medium of instruction. Motivates students to participate in their expectations for their classroom, given to them by their teacher of record. Develops and implements strategies which lay the foundation for student success. Provide help and assistance to students of various age levels in various subjects, such as English writing, mathematics, and basic American sign language. Objective : 3+ years of experience as an Online Tutor is now seeking to teach and inspire life-long learning in secondary English students. Skills : Microsoft Windows, Microsoft Office 2013, Photoshop, Illustrator, Excel, PowerPoint, Publisher, Outlook, Word Working Knowledge Of The Internet, Social Media, Blogging, And Website Design (HTML) Online Classroom Systems (Blackboard), And Skype. Modifying the general education curriculum for students based on a variety of instructional techniques and technologies. Fostering meaningful relationships among students through student tutorials in asynchronous and real-time modes. Instructing English, college essay writing, high school essay writing, reading, English as a second. Providing online tutoring services on sat, act, TOEFL exams, as well as high school English literature and college application essays. Providing constructive feedback regarding students performance and language. Promoting the development of speaking skills in students through interactive games. Promoting the development of writing skills in students through editing their essays.